Andean Vineyards is a premium wine brand representing the synthesis of Argentinean viticulture – diverse varietals from site selected, high altitude vineyards from the best sub regions for each varietal. These wines, grown in the foothills of the Andes, represent the dream to produce wine in harmony with the earth. We believe our environment is precious because our vineyards rely on a balance of nature to produce superior fruit. The packaging communicates the concept of “Wines from the Andes”, fresh, elegant, expressing the terroir of each of the valleys. The Condor is the ¨icon bird¨ from The Andes Mountains. Elegant, it raises on the Andes Peaks always prepared and alert to all signals. 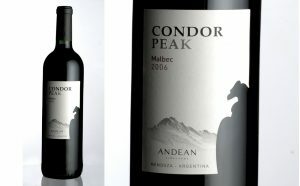 Like the Condor, these wines are linked to the image of Andean Mountains.